Florida Atlantic University Head Softball Coach Joan Joyce is one of those rare people to enjoy success as both a player and a coach. After concluding an illustrious playing career that spanned parts of four decades in numerous sports, Joan Joyce was named head coach at FAU in 1994. Joyce is the only head coach Florida Atlantic softball has had in its 15-year history. Under Joyce the program’s accomplishments are unparalleled: eight-consecutive Atlantic Sun Conference Championships (1997-2004) – nine in all (2006) – and six-straight NCAA Tournament appearances (1999-2004) – seven in all (2006). In FAU’s first season as a member of the Sun Belt, the Owls were crowned regular season and conference tournament champions. Three times the Owls have won 56 games or more, most recently in 2004 when their 56-18 mark was the third-highest win total in program history. FAU’s defense of its A-Sun title that year was not an easy one, as it took a dramatic doubleheader sweep of UCF in the regular-season finale to clinch the top seed for the A-Sun Championships. Joyce began planting the seeds of success immediately upon taking the reins of FAU softball. She spent nine months creating a program from scratch, and the result was an impressive 33-18 record in year one. Not only did that first year earn Joyce her first A-Sun Coach of the Year award, but she was also named Palm Beach County Coach of the Year. The building effort continued in 1996, as the team finished 37-32 and advanced to its second-straight A-Sun tournament. That year also saw Joyce take on the role of Senior Woman Administrator at FAU, a position she held until 2001. The record run of championships began in 1997 with not only the program’s first conference championship, but FAU’s first A-Sun title in any sport. That success resulted in Joyce’s second A-Sun Coach of the Year award. In 1998, the team repeated as A-Sun champions. In 1999, the A-Sun was given an automatic bid to the NCAA postseason tournament for the conference champion. The Owls won their third straight A-Sun Championship and appeared in the NCAA Tournament for the first time. FAU posted a 49-20 record, good enough to earn Joyce another A-Sun Coach of the Year award and her entire staff the Southeast Region Coaching Staff of the Year award by the National Fastpitch Coaches Association. In 2000, FAU would win its fourth-consecutive A-Sun title and return to the NCAA Tournament. The season also featured an 18-game winning streak and another A-Sun Coach of the Year award for Joyce. The 2001 season ended with similar results, an A-Sun title and a trip to the NCAA Tournament while finishing with a 46-21. In all, Joyce has coached 25 First-Team All-Conference selections and 27 Second-Team honorees. In 2002 FAU set a team record and led the nation with 62 wins. It resulted in Joyce’s fifth A-Sun Coach of the Year award. It was also in 2002 that FAU received its first no. 1 seed, one of eight in the nation, for an NCAA Regional. In 2003 FAU won 31 of its last 41 games en route to the same postseason success. From 2003 to 2004, FAU’s schedule was one of the toughest in the nation as the Owls faced at least three teams that went on to the Women’s College World Series. Each year Joyce continued to raise the expectation level for a program that, since its inception, has averaged 45 wins per year, making FAU softball one of the top programs in the nation. FAU was undoubtedly one of the best programs during its time in the A-Sun Conference, claiming more championships (nine) than any program in the 27-year history of the A-Sun. With so much success, sometimes a season simply cannot match the high expectations. For Joyce and FAU, that season was 2005, when the Owls went 37-32, clinched the second seed for the A-Sun Tournament but saw their streak of conference titles and NCAA berths come to an end. Of the 32 losses, 19 came against teams that eventually qualified for the NCAA Tournament. 2006 saw a return to the top as FAU captured its ninth conference crown in 10 years during its final A-Sun campaign, and returned to the NCAA Tournament where the Owls advanced to the regional finals, picking up a pair of shutout victories over the University of Florida. In 2007, the Owls came from behind to take the Sun Belt’s regular-season title on the final day of conference play, and after being upset in the opening round of the conference tournament, won five straight games including a triple-header on the tournament’s final day to edge Troy 1-0 in the championship game for the program’s first Sun Belt Tournament championship. FAU sought to defend its Sun Belt regular season and tournament titles, and actually had a better conference record (17-7) than it did its first year in the conference (16-8). However, the Owls were supplanted as regular season and tournament champions by eventual Women’s College World Series participant Louisiana-Lafayette. In 2009 the Owls struggled to a 7th place finish in the Sun Belt during the regular season, but made a run all the way to the Championship Game of the Sun Belt Tournament. Coach Joyce had two players named to both the all-conference and all-tournament teams and Caitlyn Bliss was just the fourth player in program history to be named to the NFCA All-Region First Team. Individually, Joyce helped sculpt the career of Nikki Myers, who finished her four-year run in 2002. Myers twice received Second-Team All-America honors and finished her career third in NCAA history in strikeouts. Joyce has coached four A-Sun Players of the Year, with Myers receiving the honor three times and Alana Klaus being recognized in the inaugural 1995 campaign. She has also coached an A-Sun Pitcher of the Year in Candice Freel and twice, the conference Freshman of the Year. In addition, she added a Sun Belt Pitcher and Player of the Year to her resume in 2007. The Owls currently have Callie Piper and Jen Musillo playing in the National Fastpitch League. Joyce’s duties at FAU have not been limited to softball and administration. Since 1996 she has been head coach of the women’s golf team. Much like the softball team, Joyce has led the golf team on a continual path of improvement. She has coached three A-Sun Golfers of the Year in Cecilie Lundgreen (1997), Jessica Polus (2002) and Natalia Navarro (2004) and one Freshman of the Year, Praewnapa Phol-Uayporn (2005). Outside FAU, Joyce has been involved both as a coach and as a player at the highest levels of softball. Her coaching experience includes a four-year stint in the women’s professional softball ranks, winning the World Series in each of those seasons. She has also coached and played softball with many of the nation’s top collegiate coaches. 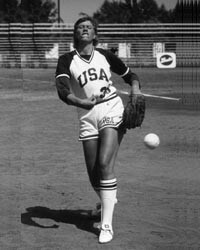 A member of the National Amateur Softball Hall of Fame, Joyce holds a career pitching record of 753 wins and 42 losses. 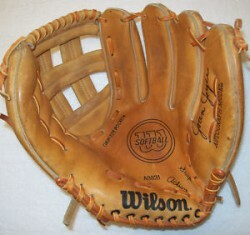 Included in her totals are 150 no-hit, no-run games and 50 perfect games. At the plate she posted a career batting average of .324. Joyce counts striking out Ted Williams in 1961 as one of her most notable achievements. A multi-sport athlete, Joyce has now been inducted into nine halls of fame. Her enshrinements include the Palm Beach County Sports Hall of Fame, Connecticut Women’s Hall of Fame, the Connecticut Women’s Basketball Hall of Fame, the Hank O’Donnell Hall of Fame, the Fairfield County Sports Hall of Fame, the International Softball Federation Hall of Fame, the National Amateur Softball Hall of Fame, the Greater Waterbury Hall of Fame, and is one of only three Americans who have been inducted into the International Women’s Sports Hall of Fame. In 1976 she was a runner-up for the Women’s Sports Magazine Athlete of the Year. Her story is familiar to the fastpitch world and to most anyone who has followed the games of softball, basketball, volleyball or golf. Joan Joyce has left an indelible mark on women’s athletics and is creating a legacy that will help to define FAU, Owls athletics and collegiate softball for decades to come.